When for the second time in two months the UK House of Commons voted overwhelmingly against Prime Minister Theresa May’s November 2018 withdrawal agreement with the EU, uncertainty was pushed beyond all previous limits. Yet only for 24 hours. Two critical votes this past Wednesday and Thursday (13 and 14 March) have injected unexpected elements of clarity into the nerve-wracking saga of Britain’s departure from the European Union. 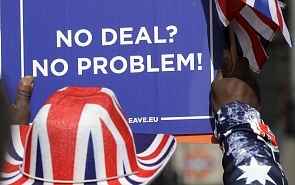 First on Wednesday, the House rejected a ‘no-deal’ Brexit; then on Thursday, it voted overwhelmingly (413 to 202) to ask the EU to extend the UK’s Article 50 withdrawal beyond the 29 March departure date. Suddenly, the Brexit ultras who regard no-deal (a ‘clean break’) as a form of national purification – and their ostensibly more pragmatic allies, who regard it as a sword of Damocles over the EU rather than Britain itself – have been deprived of oxygen. For this reason, Financial Times columnist Sebastian Payne forecast that the PM ‘may be losing her way to Brexit victory’, and he might be right. Scenario building is now a rational exercise. Yet the three most likely outcomes are decidedly different. A short-term (‘technical’) extension. As all sides in this debate know, the House of Commons may demand a delay to Britain’s withdrawal on 29 March, but it is up to the EU to agree. The latest guidance from the EU Commission recommends granting a three-month extension should the House, at the third or even fourth attempt, approve the withdrawal agreement. This will afford time for passing the necessary legislation and securing Britain’s orderly withdrawal by the time newly elected MEP’s [Members of the European Parliament] take their seats on 2 July. What the EU will not agree is an extension for further negotiations. It also looks set to contemplate a much longer extension, but only if the UK participates in EU parliamentary elections and reconsiders its course. For once, the EU’s position suits Theresa May perfectly. As she has warned more than once, refusal to pass her deal risks prolonging Brexit indefinitely or not leaving the EU at all. Faced with this choice, it is just possible that she will secure a winning coalition between those who think her deal is the best of all possible worlds and those who think it is the least of all possible evils. A longer-term (9-21 month) extension. But she might not. That is why the EU summit of 21 March will consider a longer extension to give Britain ‘time and space’ to ‘rethink’ its position. But it wants the UK to define a clear purpose: a general election, a second referendum or perhaps by one of these routes, membership in the Single Market, Customs Union, or a decision not to withdraw at all. Withdrawal without agreement. Yet there is nothing to say that a new national conversation will not redraw battle lines roughly where they stand today. If so, ‘no deal’ could find itself back on the table. As Rory Stewart (Minister of State at the Department of Justice and an ardent Remainer) has stated, ‘ambivalence about Europe reflects longstanding aspects of our political culture’. The challenge for Brexiters is to show that, outside the EU, Britain can be a more solid friend and ally than it would be if it remained reluctantly in. The UK is a force multiplier in the EU and a pillar of Atlanticism inside it. Remainers argue that it is as a European power that Britain strengthens Atlanticism. If Britain is outside, the Atlanticist impulse will weaken, and other impulses will make themselves felt. Nevertheless, a solid body of Brexiters claim to be far more robust Atlanticists than the Europhiles. They strongly oppose the cause of ‘European defence’, which they argue diminishes NATO by design and in practice. In response to this, Remainers can point to many dimensions of European security that NATO lacks the competence to address. NATO is a hard power animal and the full spectrum of security threats requires a well-integrated division of labour between the Alliance and the European Union. Remainers also ask how geopolitically robust ‘global Britain’ will be given the commercial pressures that a go-it-alone Britain will face in securing terms of trade with global giants such as China as favourable as those it now enjoys as a member of a 500-million strong trading bloc. From Russia’s perspective, Britain’s presence at the top table of the EU has been an important factor institutionalising US power in Europe and giving ballast to the Euro-Atlantic system. The UK’s departure from the EU risks aggravating already considerable threats to Euro-Atlantic cohesion. The ‘Trump factor’ further adds to the risks that a detached Britain poses. For this reason, Remainers see Russia as a net beneficiary of Brexit, and they need little persuading that it has invested financial and moral capital in the process.